Since it’s no longer my birthday (huge thanks, by the way!) and I’ve only just finished the leg on the second Mona sock, I thought I’d divert your attention with another little pretty. Told you the knitting would be slow and, frankly, I don’t think you give a hoot about a progress shot. There’s something new on the horizon (besides socks), but I won’t cast on until I have a finished pair to offer the Knitting Deities. You understand. Wow, super beautiful flowers and Happy Birthday to you!! Gorgeous flowers! 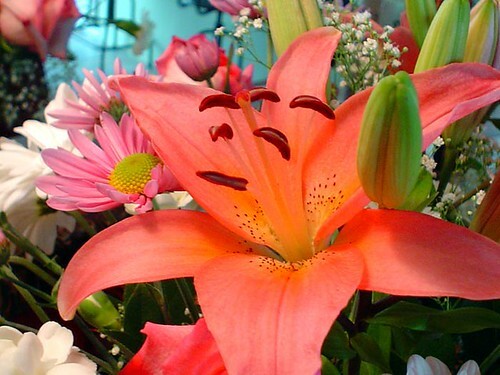 Lilies are the best. Lovely photo, the flower is practically vibrating with the colours. And Happy Belated Birthday! I agree with Susan – it looks like a gorgeous Georgia O’Keefe painting! WOW! those lilies are so beautiful! great photograph. Oh wow! Those are gorgeous! And I’d be having a happy birthday indeed if those showed up on my doorstep. 🙂 Lucky, lucky you. Oooh so beautiful! And Happy Belated Birthday!! Looks just like a Georgia O’Keefe painting! Pretty indeed! Happy Birthday (belated)!